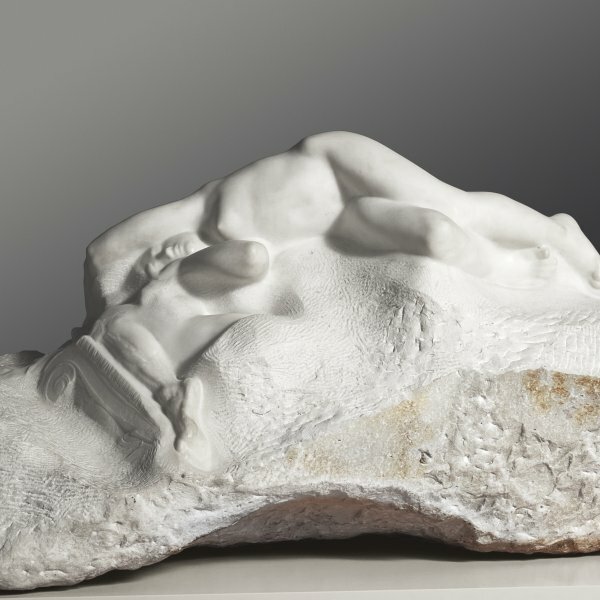 In parallel to the execution of public commissions during the 1880s, and in particular after the success of his major retrospective exhibition in 1900, Rodin produced new sculptural groups using a totally innovative technique in sculpture: that of combining earlier plaster casts from his studio in Meudon. The Dream (The Angel’s Kiss) was made from the combination of two earlier casts, Suffering no. 1 for the lower part and Woman lying on her Back (inverted) for the upper part. In the original plaster model for this marble version the figures are combined in an artificial manner, leaving a large empty space between them. The final result in marble is, however, much more unified. A cloud of mist unites the two figures and gives the group a markedly Symbolist feel. In Rodin’s hands a technical problem acts as a stimulus for the judiciously resolved final version. The Dream, sometimes called The Angel's Kiss and often confused with The Phantom Kisses the Young Girl, belongs to the group of winged figures that appear several times in Rodin's work around 1895-1900. The most famous is undoubtedly Illusion, Sister of Icarus (marble at the Musée Rodin, exhibited at the Salon de la Société Nacionale des Beaux-Arts in 1896), in which The Martyr can be recognised, given wings and oriented so that it glides downwards. Once again, this is a group created by assembling existing figures. The Dream is made up of Pain no. 1, a female figure with her head hidden between folded arms and seen from behind in the right upper corner of Gates of Hell. There, her legs are still trapped in the piece of marble against which she leans and her feet are therefore not visible feet. The same figure, with its feet visible, reappears in the Rodin exhibition in 1900: no. 8, Female Figure Lying on her Stomach. In this case she is lying horizontally on a pedestal. 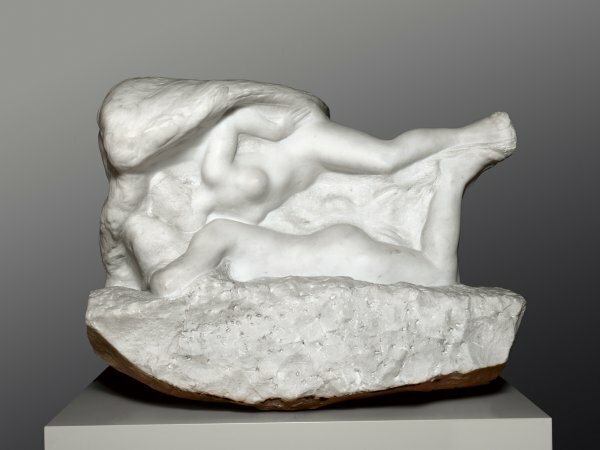 For the present work, Rodin reused the same position and completed Pain no. 1 with another female figure that was also exhibited in 1900: no. 13, Woman Lying on her Back, bent and with her hands on her hips. This figure, of which the Musée Rodin possesses several plaster proofs, combined with Kneeling Man, had formed The Phantom Kisses the Young Girl, of which the marble version of 1894, exhibited in 1897, had belonged to the Peytel Collection (now in the Walker Art Center in Minneapolis). In the catalogues of 1931, 1939 and 1944 Grappe dates the plaster cast of The Dream to before 1889 on the basis of a text by Judith Cladel. In reality, the assemblage of the two figures was undoubtedly created ten years later. Cladel's text, published in 1902, must be from shortly before 1900: in it, she speaks of the Gates of Hell (commissioned in 1880), stating that Rodin has been working on them for twenty years. However, she also saw in the studio The Death of Alcestis in its wooden box and as this work was exhibited in 1899, it must have been taken out of its wooden box in 1900. The marble was reproduced after 1906 by Gustave Kahn, who stated that it was a new work. Rodin had, therefore, executed it in marble without waiting for it to be the subject of a specific commission. It must have been during a visit to Paris-possibly in December 1908-that Thyssen saw it and wished to acquire it. Nevertheless, Rodin took a long time to send the work to him despite being reprimanded by the client three times. "The snowy wing of a large swan lowers itself over the tired dreams of a woman who seems to be listening to the harmonies of the earth rising up from the ground! Judith Cladel offers an analogous explanation of the group: "It is, " she says, "a subject that has been repeated to the point of vulgarity but that here is reborn in its true beauty [...] A woman sleeps with her face in her arms and in her long hair while a spirit of protection quietly hovers over her, circles her beautiful body the way in which a morning mist enlaces a mountain. It is the Dream, Rodin says [...]; he visits the woman and with his hand he holds his wings in order not to make any noise". As usual, however, Rodin's works are open to differing interpretations. The sculptor himself wrote on the back of one of Druet's photographs (Musée Rodin, Ph. 5515): "Angel of evil coming from the abyss suggests a praying man." After the work was shown at the fourth exhibition of the International Society of Sculptors, Painters and Engravers in London in 1904, the critic of The Truth saw a consoling spirit in it, but found the position of the two figures "simply comic. In fact, the group rather makes one think of one of the favourite rituals of an hypnotic séance or of some unusual gymnastic exercise rather than of blissful inspiration born from the brain of a brilliant sculptor". This undoubtedly refers to the bronze which was exhibited. And while in the marble version, a block treated in such a way as to suggest a cloud of mist would create a sense of unity between the two figures, in the plaster model (as in the bronze) the winged figure is completely separated from the other and only leans on the soles of the other figure's feet.